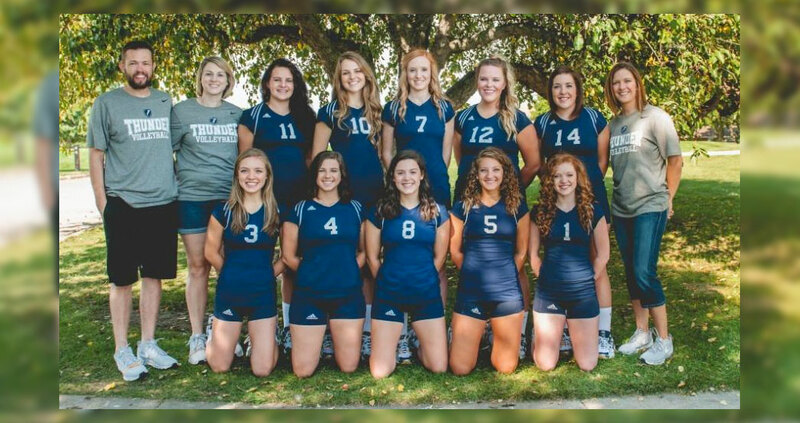 The Lady Thunder finished the season going 1-3 at the NCCAA National Tournament. MCC went into the tournament as the #3 seed and opened up play against the #7 seed Arlington Baptist College. ABC proved to be a tough match, and with their consistent and strong offense took the match in three sets from the Thunder. "We struggled with getting our offense going, one of our top strengths," said Coach Sanders, "We started out hesitant and slow, and at the National Tournament there's no place for that." After a game off and time to regroup, the Thunder were ready for the next match against the #6 seed Pensacola Christian College. MCC started off the first match with a quick win in the first set. However, MCC's struggles with consistency continued to affect the team, and PCC took the next three sets. "It was a disappointing first day for us," stated Coach Sanders. "We had high expectations and we just did not meet them on the first day." After dropping the first two matches of the tournament the chances of moving out of pool play were slim for the Lady Thunder. Coach Sanders said, "I told the team to put today behind them and move on to Friday, we still had the opportunity to play two more matches together as a team and just to enjoy the experience. Play with no pressure and just for the joy of playing together!" The Thunder's first match on Friday brought the #10 seed North Central University. This was the second match up of the season between MCC and North Central. MCC won earlier in the season in 4 sets. With a new outlook on the matches, MCC came out strong and relaxed, taking the match again in 4 sets. The next and final match for the Thunder was against the #2 seed Providence University College. Again, the Thunder squad played a great match and fought hard but Providence was able to take the match in 4 sets. Several Thunder players were awarded national awards at the National Tournament Banquet previously in the week. Junior middle hitter Wynnette Sommerfeld was named a Scholar Athlete. Sophomore outside hitter Robynn Elan-Puttick was named NCCAA 2nd Team All American and AVCA All-American and senior middle hitter Carrie Pilkington was named NCCAA 1st Team All American and AVCA All-American.